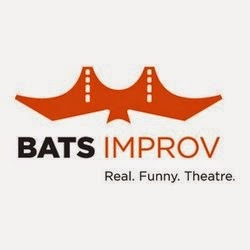 This Feel Good Friday, I'm going local and talking about an organization I work with, BATS Improv. Founded in 1986 and located in San Francisco, BATS Improv is "a professional theatre company and an artistic community that cultivates and innovates the craft of improvised theatre through engaging, playful, creative performance and training." If you live in the Bay Area and have the opportunity to go to a BATS show, I would recommend it as an entertaining way to spend an evening. But BATS is more than just shows. Right now, three other BATS coaches and I are in the middle of a 7-week program teaching improv to 4th graders. Each hour with them is spent playing improv games and we all have a lot of fun. While we're laughing and making up stories, we're also teaching the kids how to create a reality together by saying yes, building on what your partner created, not putting any limits on your ideas and failing graciously. Lessons that make an improv scene work? Yes. Lessons make a life work? Also yes. It's no surprise that these are the lessons we want to share with 9 and 10 year olds when you consider BATS' vision. As stated on their website, "We envision a world where everyone is comfortable in their own skin, where ideas and flights of fancy are encouraged, respected, and given wondrous, unimaginable form through spirited, skillful collaboration. Where life itself is recognized as improvisational and the skills of improvised theater are embraced as life skills." The full vision statement can be found here. While all of this makes me feel warm and fuzzy inside, the most classic "Feel Good Friday" aspect of this organization is the Laughing Stock program, which has been running for the last 15 years. Through Laughing Stock, BATS offers free improv classes to people living with chronic and life-threatening illnesses. Their caretakers are also eligible to take the classes. The sessions "focus on improving quality of life through humor, easy physical activity, group interaction, gentle risk-taking, and imagination games." If you, or someone you know, would benefit from one of these sessions call (415-474-6776) or email (laughingstock@improv.org) the office. Working with BATS in particular, and being an improviser in general, has helped me become a better listener, stay focused on the present moment and find a way to accept and build on whatever situation I find myself in. Not only that, I get to become a variety of characters on stage I'm not allowed to be in real life! So how do you support BATS Improv? See a show, take a class, like the Facebook page and follow them on Twitter @BATSimprov. You'll be glad you did!